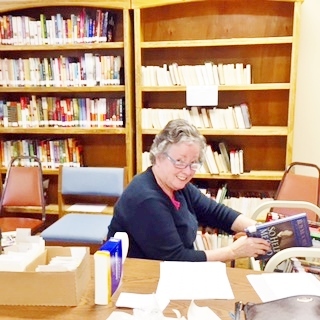 Lynda Walden sorts some books. The library is located in room 2 in the annex. The books have been processed according to the Dewey Decimal System. Besides nonfiction and fiction, there is a nice selection of books for children and youth on the shelves. As you come into the library there is a desk set up on the left. Directions are on the desk: Sign the card that is in the front of the book and put it in the box designated for cards. You might like to add the date you checked out the book. When you return the book, take out the card and place it back in the pocket in the front of the book. Leave the book/books on the desk to be returned to the shelves by the librarian only. Lynda Walden is the church librarian. Examples of fiction books for children and youth are: • Trapped at the Bottom of the Sea: The Tombs of Amak by Peretti • The Desperate Diva Diaries by Spady • The Jack Staples Series by Batterson • The Red Rock Mysteries by Jenkins • Horse Diaries: Bell’s Star by Hart. Examples of fiction books for adults: • Butterfly Palace: Without a Trace by Coble • Restoreth My Soul: The Shadow of Death by Viguie • The Prince; The Priest; Martha by Rivers. Examples of nonfiction for adults: • Several Southern Living cookbooks and other cookbooks (641.5) • In the Vineyard of the Lord by Rice (811) • In the Empire of Genghis Khan by Stewart (950.2) • Where God Was Born by Feiler (200.95) • Five Practices of Fruitful Living by Schnase (248.4).